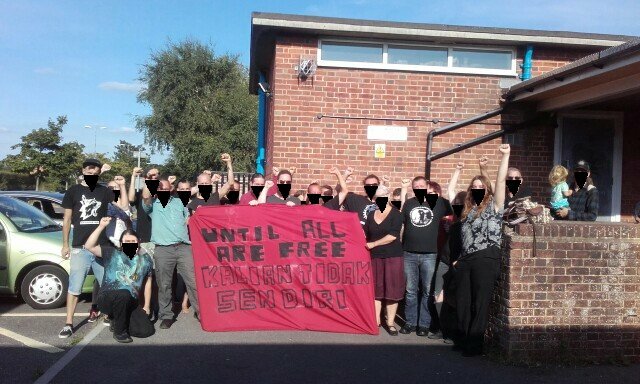 At the end of the 2nd Dorset Radical Bookfair (an anarchist bookfair also dubbed ‘Anarchy by the Sea!) 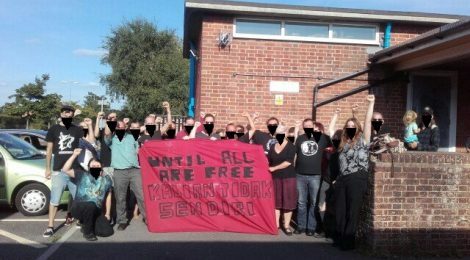 that took place on the South coast in Bournemouth on 4th August, Bristol group of the Anarchist Federation prompted a display of solidarity with anarchists imprisoned in Indonesia who we have had contact with over the last few months via a call out from Indonesian Anarchist Black Cross (see https://freedomnews.org.uk/indonesia-solidarity-call-for-anarchists-imprisoned-in-yogyakarta/ for background and ways to help). Kalian Tidak Sendiri (You are not alone)”. A really good series of talks and discussions were put on during the day: 2nd Dorset Radical Bookfair talks August 2018 [PDF].